The mere cover of this album draws the attention to the call in the title it is possible to make the cover wink with the quick pulling up and down of the inside cover (unfortunately those who have this album on CD cannot do it). But if after a short play with the cover one puts the album on the turntable, (s)he can immediately make sure of that the first class cover hides first class music. It is tense, twisting and hard with fantastic solos all along. This album is rather brother of Sweet Fanny Adams than of its predecessor, Desolation Boulevard. Unfortunately the sound engineer’s work is appallingly bad, the whole record is undynamic, sounds dimly and veiledly. But Andy & Co. indemnify the listener with their music. 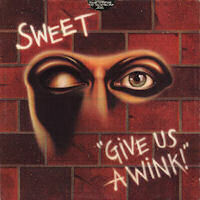 The Give Us A Wink is one of the best underrated albums of the rock history, but is was a honourable mention that the Repertoire re-issued it in 1990. The album is glowing by constant heat all along, there are no considerable mood changes in it. The extrovertness is not so emphasised as on Sweet Fanny Adams, but still stands nearer to it than to the far more intimate and personal Desolation Boulevard.It has beenthe most dense SWEET music until the datein respect of the instrumental occurences. The only dreamy and mystic song, the 4th of July has also quick tempo and is not a real lyrical song. In the same time it’s interesting that the slowest song, Healer, however, is a very hard song. The lead vocals are handled by Brian in each song and they composed every song together (though it is well-known that in the composing work, mainly in the final elaboration, the most work were performed by Andy and Steve). The compositions are long that gives good occasion for the solos that is totally utilized by the guys, mainly by Andy. It’s the first case in the SWEET’s history that they are using synthesizers in some composition. Nevertheless it does not play a leading role nowhere, maybe in the opening track only.. The album is starting with a sysnthesizer voice that is a bit similar to the cricket chirp, then the guitar-bass-drum trio is brutally blasting and a simple, stamping drumming is giving the basic rhythm that is unusual from Mick and is sounding as if Mick was keeping on kicking a big cupboard with a brogue. It is the simplest song on the record, it has been released on single not long before the album, actually as a follow-up for the album. The song, despite its simplicity, is impressive, the choir is very good in the refrain in which Steve is singing a line in solo. There is some overture-like in this song, so to put it on the record as opening track was perfect choice. Mick is breaking on the drums in the beginning of the song in the way as if he had enough of the very simple, monotonous drumming he was constrained to do in the previous song. From this ‘wide’, ‘big space’ drum overture that recalls John Bonham’”s drum work, a relatively slow piece with pulsating rhythm is evolving that is the relative of the Into the Night in rhythm and melody line. Brian is singing the verses a bit in Steve’s rap style and very hard, almost only is dashing off the lines furiously. The refrain is completely strange, tuneless with an oddly shifting choir. It is almost impossible to find out the rhythm during the singing in the refrain. Therefore this very hard song is still floating and has a surrealistic feeling. The instrumental middle section is brutally hard and very fast. This song was the B side of the single The Lies In Your Eyesand also here fits well as is following it. Superb music where Mick is the most hyped amongst the guys. Despite musically it is one of the most outstanding compositions in SWEET’s career, is not listed generally as one of their highlights. Perhaps it is Mick’s other greatest song in addition to the Man With The Golden Arm that one can consider as his hymn. Though the song was composed by the band, Mick drumming is an almost continuous solo that makes the song’s pulsation extremely exciting. Actually there is no one moment in which Mick does not perform some stormy theme. Despite it, Mick’s drum is not drowning the other instruments and Brian’s voice out. The brilliant composition’s only weak side is the bland singing and melody. It can be felt that the guys took delight in working on the song in the studio that was based on improvisation and I suppose that the song was recorded in live in studio way. Fantastic amount of energy is concentrated in this song and even the the most choosey listeners would gasp for breath if it was a pure instrumental composition. Because, if we glorified Mick, the finest words can be told about Andy and Steve’s play: virtuoso, quick, twisting and mainly is full of brilliant ideas and turns. Though there is no moment when the listener can predict what will follows, it is still a precisely constructed and consciously edited composition that goes from a starting point, in an ordered progress, to a closing one. Brilliant song. This is the album’s only mystic, dreamy song that is, in the same time, a middle tempo hard rock. The verse lines are hard and whirling but strangely floating all along that is fullfilled in the celestial choir of the refrain. This part is from the finest moments of the legendary choir works of the SWEET: soaring, mystic and incomprehensible. This hard song is becoming almost hymnic when is arriving at the end of the refrain but is staying very far from the cheesy straining after effects. The cosmic feeling is increasing in the instrumental movement when suddenly, but finely, a dreamy electric piano solo is fading in from somewhere that is performed by their friend, Trevor Griffin. This is a bit as if in front of a bizarrely beautiful celestial background, a space creature was swimming all along, playing on the piano that is floating together with him. The whole surrealistic pattern is starting to be lost in haze, when – by a bit distorted voice – a vague choir is appearing to the more and more enchanting floating. This is the beginning of an awakening where the listener is falling back to the main theme. After the subsequent refrain the previous feeling is coming backonce again in a bit different way. One would expect that the composition is ending by fading, but instead, the listener is quickly getting back to the real world and after repeating of a monotonous riff, the song and the record side is ending by sound of a big crash. The listener lived through some of the greatest, most unforgettable moment of rock music that are one of the most outstanding work in SWEET’s career. The break, when the listener turns the record, stands the him in good stead to digest the occurences of the previous minutes. It’s another masterpiece. The beginning is almost shocking and in the same time very particular. Three celli are playing the bizarre and weird overture. Andy, Steve and Mick are rasping the same tune quickly on the celli developing forbidding feeling. Andy’s synthesizer fantasy is coming to it in which a chirp is sounding together with a church organ. Then, as in many cases, blasting is the guitar-bass-drum trio. But suddenly everything is becoming silent and only Andy’s monotonously pulsating, direfully hard guitar voices are remaining and to this background Brian is starting to sing the first strophe. It is a particularly furious song about the situation when the art gets into the imprisonment of the marketing. If there is someone who can tell about it, they are those. And they are obviously furiuous, since it has happened not long before they have been released from the ‘Chinn-Chapmann prison’ (this song was released as single in 1975, one year before releasing of the album Give Us A Wink). It is interesting that this song has three version: one is the version of this album, the other is the single version and there is a third one released on the album Strung Up. Only the opening movements are different in the three versions, the additional part of the song is the same. The sung part with the bridge is completely especial and experimental: in the two channels two and two guys are singing completely different themes and the acompanying duo can be heard rather as background. It is an extraordinarily loud and noisy composition, a real rampage. Even those who don’t know the lyrics can feel that here not the rage during the ‘imprisonment’ is present, but that after the disengagement (in case of Sweet Fanny Adams, the latter has been present). The refrain can be a slogan of a demonstration against the producers: ‘Everybody wants a piece of the action!‘. The bass and the drum is playing rather an accompaniment, while the leading instrument is Andy’s doubled feed-back guitar. It’s a pity that this song was made originally as single and therefore the length was limited. Unfortunately when they later put it on this album, did not develop on these very interesting experiments included in the song. It is a hard, mid-tempo composition, has a draggingly pulsating rhythm, almost it is possible to dance on it. Andy’s solos are good but seem to be less impressive than in most of the cases, all along the song some tiredness in composition work can be felt. Brian is singing the song furiously like Action as if his anger would have not passed away. There are some interesting parts in the instrumental part but, in some places, it still seems as if they would not have had real good ideas. The end of the song is similar to that of Rock’n’Roll Disgrace three years ago: as if they would not be able to finish it, always there is an instrument that naughtily interposes (but the realization of this idea has been stronger in the Rock’n’Roll Disgrace). A devastatingly fast, very hard song. Brian is singing the strophes very severely and the unrealistically high falsetto singing of the refrain, led naturally by Andy, is a very exciting counterpointing for it. To the choir of the squeaking white mice, Andy’s wide melody electric guitar theme is giving the backround that is increasing the antagonism with the monotonously rattling, fast rhythm and the hard sound. In the instrumental movement Andy’s quickly and pulsatingly changing improvisations are running on a strongly distorted guitar. His solos are unusually long between the subsequent strophes and the improvisation is turning out to be mature in the instrumental section. The listener thinks in some part that the heat of the guitar play cannot be enhanced but Andy is falsifying and always able to superimpose a bit. It’s a pity that two fantastic musicians like Mick and Steve practically didn’t get possibility to sow their wild oats on their instruments. Only to provide the tense base remained for them. Andy, however, was obviously hyped and communing with those minutes in the studio. It can be felt that he almost is not able to finish the play. His improvisation is becoming as good as shocking when the original theme is returning. It is a superb composition, one of the highlight of the album and a cool instrumental fantasy is left even to its end that is then gradually fading. The closing composition of the album is the longest and in the same time the most particular. It is slightly meditative and has a slow, stepping rhythm. The wide, live-like dubs are leading the song. It is completely unusual in SWEET’s career that the drum would dominate in the forefront of the other instruments in a song on a level like in the Healer. The melody and the whole feeling is unusual from the SWEET. A person, who is in the twilight of his life, is asking the healer to cure him. The song is slowly rolling on and is dominated by the slow shlepping of the old man. However the stepping-like rhythm is actually not so slow like an old man’s steppings. It is faster and more definite than that of an ill old man. This ‘acceleration’ and definiteness emphasises the toughness of the request: cure me, cure me, cure me…” asking is the old man, what is more, almost begging but very definitely. Solely the cry ‘deliver me‘, that can be considered as a kind of refrain, flavours of the usual SWEET style, though mainly due to Andy’s electric guitar voices. The end of the song is becoming conpletely surrealistic and is recalling a tribal ritual: they are invoking the spirit of the healer magicians. The illness and the old-age of the person is naturally a symbol that can refer two kind of people: one has a lot of tresspasses, the other is tired and uninspired at the imprisonment of the marketing. The crying ask ‘deliver me‘ that means ‘set me free’, also refers it. It’s a whimsical song that cannot be loved so much as far as it is good.